In the highly competitive world of real estate, we can all agree, that speed and price are two of the largest factors when it comes to buying and selling homes. As a real estate agent, you can also agree, that meeting these needs isn’t always the easiest of tasks. If you are a seasoned and successful real estate agent though, we are sure you’ve heard it before, that better real estate photography can help your properties sell faster and for more. Are we right? Well, it’s time to take things one step further, or shall we say, to a whole other level! When 92% of home buyers use the internet when searching for their new home (Redfin.com), your listings better make the best first impression! Professional photographs that highlight the best features of the home are a great start, but home buyers want to see more nowadays than just a few rooms and the main living area. They want to see the entire property! Even more, they want to see their new neighborhood and its surroundings, and how else, but with some added aerial photographs! #2 Virtual tours from inside, out, AND up above, open buyers hearts…and their pocketbooks! In a fast paced world where video accounts for more than 74% of all online traffic (Hubspot.com), why should our property listings provide any less?? Professionally produced real estate videos and video tours entice home buyers and their buying emotions, making them feel immediately involved with a property. In addition, when it comes to online videos, 92% of all mobile viewers share these videos with family, friends and followers alike, immediately increasing the buzz around your property, which helps increase the perceived property value and selling prices! #3 A lower cost than the alternatives means higher ROI for you! Just a few short years ago, hiring a professional to take aerial photography meant having to rent a plane, hire a pilot AND hire a professional photographer. You were lucky if you found one that did all 3! With the more recent emergence of drones, this investment is a MINIMAL FRACTION of the cost and is now accessible, more than ever, to real estate agents of every kind: commercial, residential, high value and even low. Don’t go running to Best Buy too quick though! 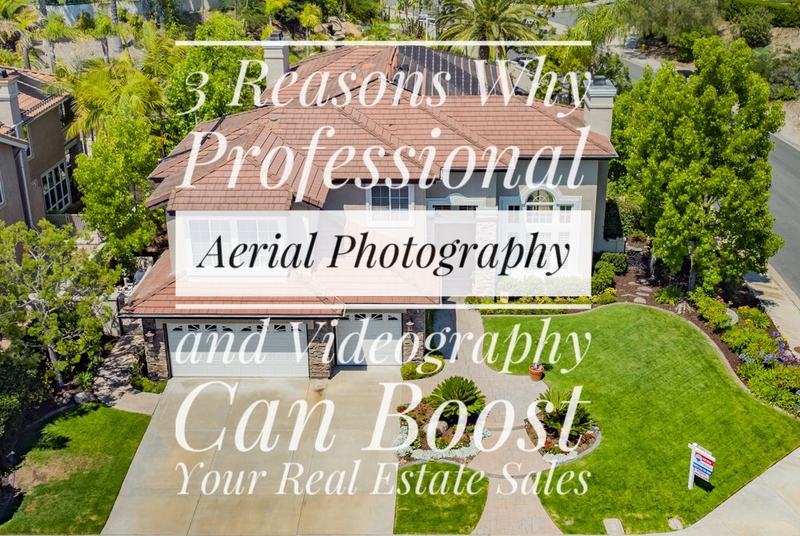 Flying a drone is one thing, taking professional real estate photographs, editing and producing a high quality video for your real estate marketing needs, is a whole other can of worms. Leave that one to the professionals, and you won’t regret it! So whether you are an experienced real estate agent, or a new agent looking to stand out in one of the most competitive markets, don’t let your real estate listings fall lack-luster to the crowd. Stand out, outshine and outsell the competition with professional aerial photography and videography services. Your marketing and your pocketbook will thank you later! This entry was posted in Uncategorized and tagged increasing real estate sales, real estate marketing, real estate photographer, real estate photographs, real estate photography, real estate video, real estate video marketing, real estate video production, real estate video tours, real estate videography.